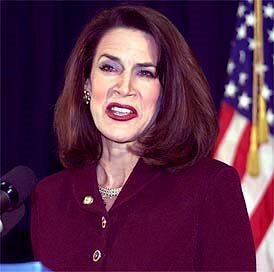 Separation of church and state is "a lie we have been told" and is "wrong because God is the one who chooses our rulers", according to Rep. Katherine Harris (R-FL), whom you may not-so-fondly recall as having headed the outrageously botched vote recount in 2000 when she was Florida's Secretary of State. That recount swung Florida into Bush's column and his heel onto the neck of the world. Harris also says that not electing Christians is a good as "legislating sin", words which may just not help her very much in her current senate campaign against Democratic incumbent Bill Nelson. Hey Katherine, somebody shoulda told you there's a lot of J-E-W-S's in your state. The Wicked Witch of the South has really stepped in it big time.